Once upon a time, there were two hikers. We will name them Shylen and Rytu, any similarities to real life people are purely coincidental and are not based on anyone in particular. Anyways, Shylen and Rytu decided to climb Mount Misen located on Miyajima, a small island southwest of Hiroshima, Japan. ”What path should we take? There is a short one, 2.5 km. The medium one, 3 km. Or the big one, 3.2 km”, explained Shylen. ”I’m okay with any of them!” replied Rytu, trying to sound sure of his own hiking capabilities. Rytu was a slim boy but he was active, so he wasn’t concerned about the physical toll of climbing a mountain. Although he knew the sun set early in Japan, he wanted to hike. He knew starting a hike at this time would mean they would risk running out of daylight. 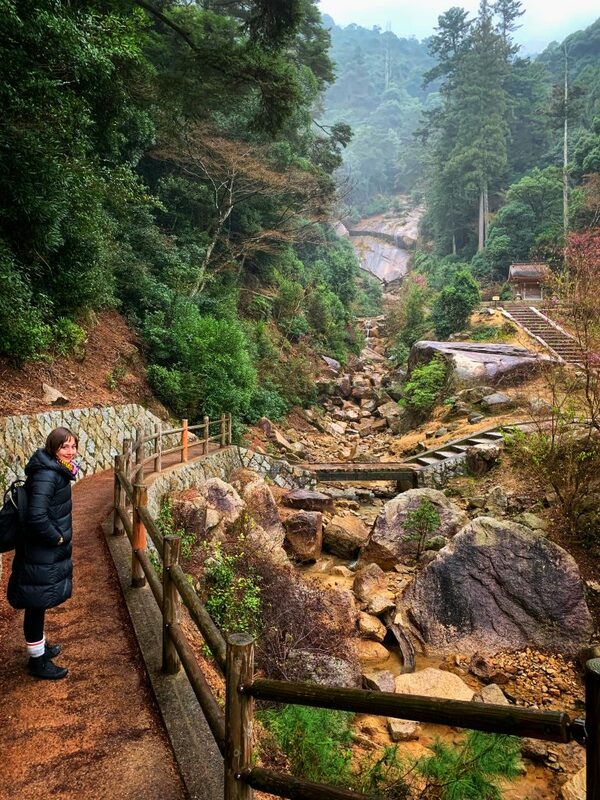 They decided, intelligently, to do the 3 km hike up Mount Misen. It was a beautiful hike. The path was not too bumpy or rocky. They made good time up the mountain, stopping to take photos where nature provided them with good views. The scenes were breathtaking even though it was foggy and lightly raining. 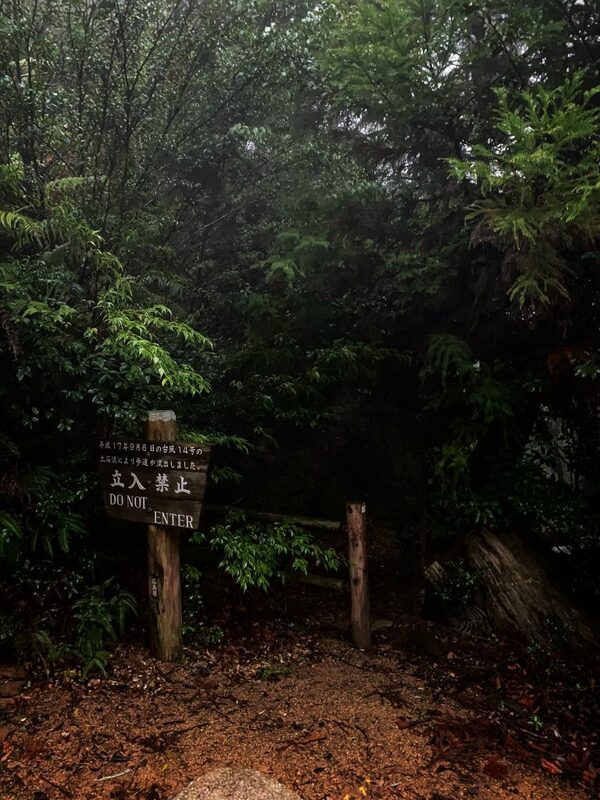 The entrance to Mount Misen. 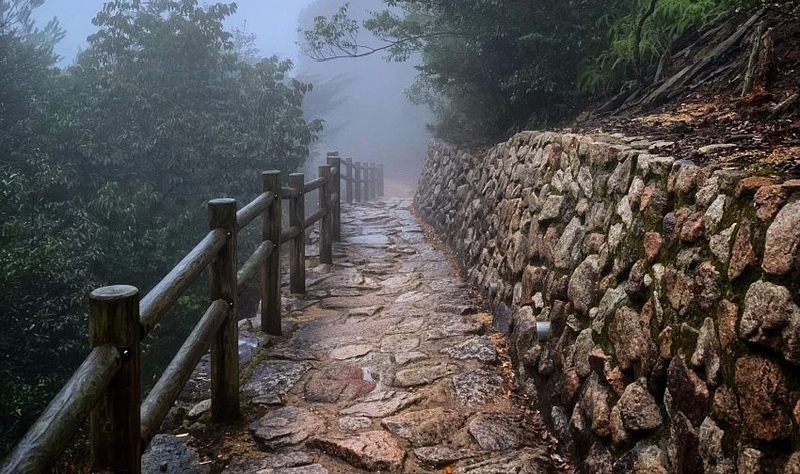 The stunning pathway that led up Mount Misen. 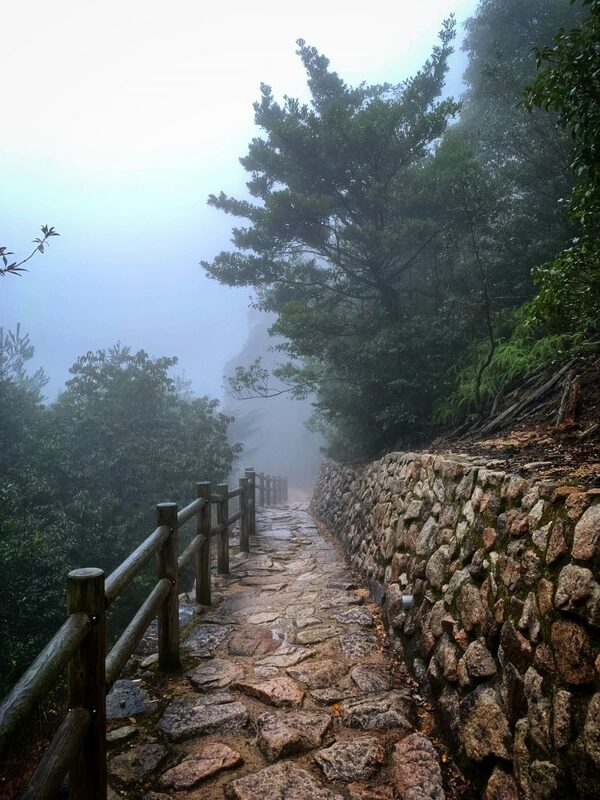 Another beautiful shot of the mountain pathway. Shylen and Rytu made it to the first rest stop where they became friends with a baby deer named Deerie (the author of this story is lazy and it can be seen through small details like this deer’s name). 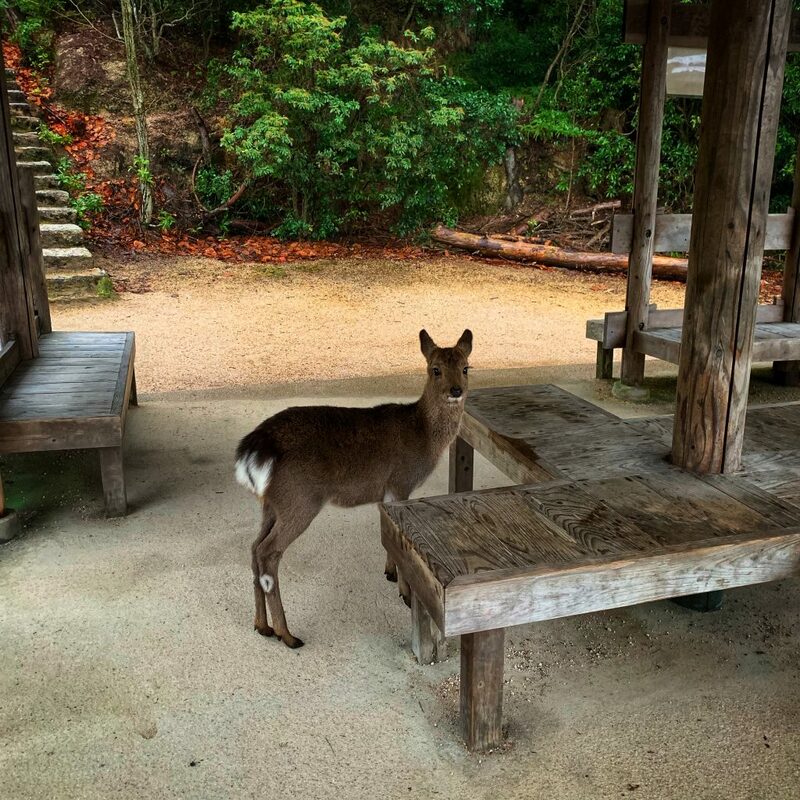 Deerie was one of the cutest deer in Miyajima and Shylen asked her how she got there. Seeing as how Deerie was a deer, it didn’t answer. The mystery of Deerie’s appearance would have to remain just that, a mystery (***cough, foreshadowing, cough***). 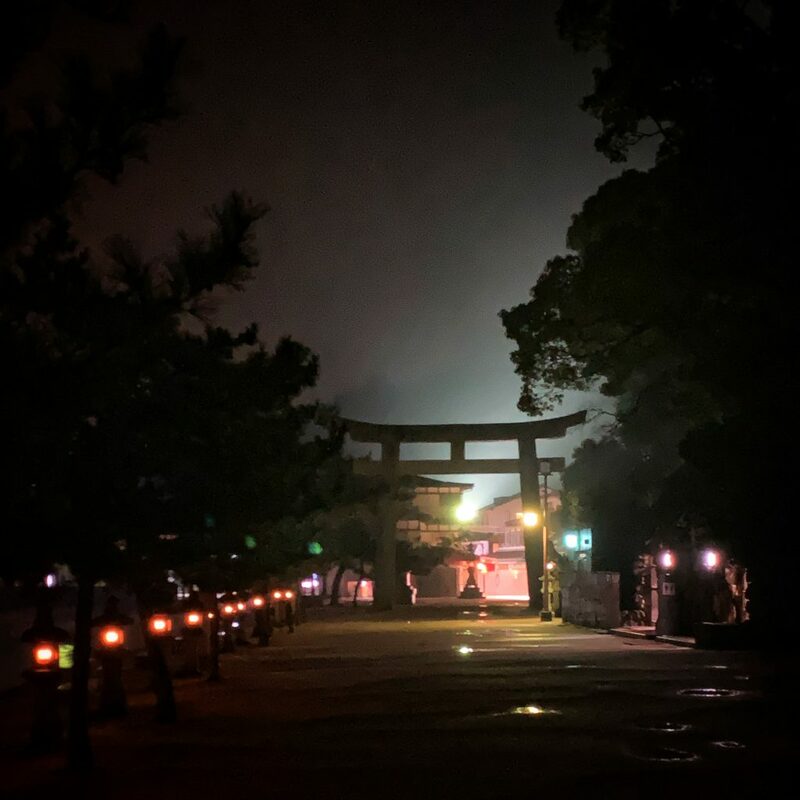 After a short break for a rest and some pictures of Itsukushima Shrine that could be seen from the lookout spot at the rest area, Shylen and Rytu continued their journey to the top of the mountain. 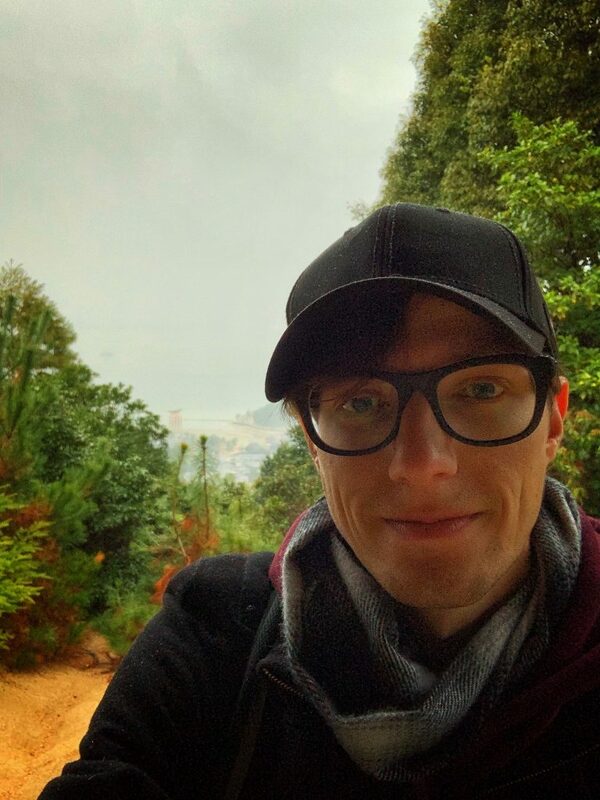 Mountain selfie with Itsukushima Shrine in the distance. 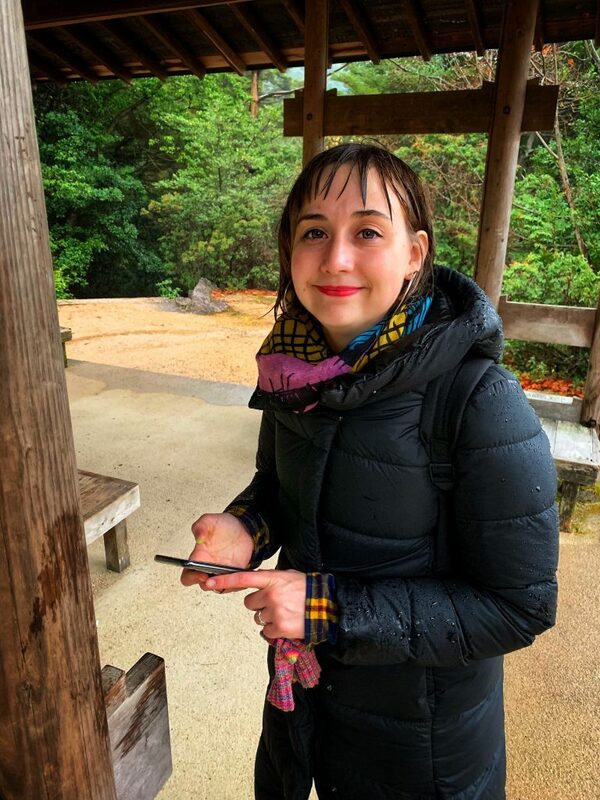 A happy, although wet hiker. The hike quickly got more challenging as the pathway became more rocky and disjointed. 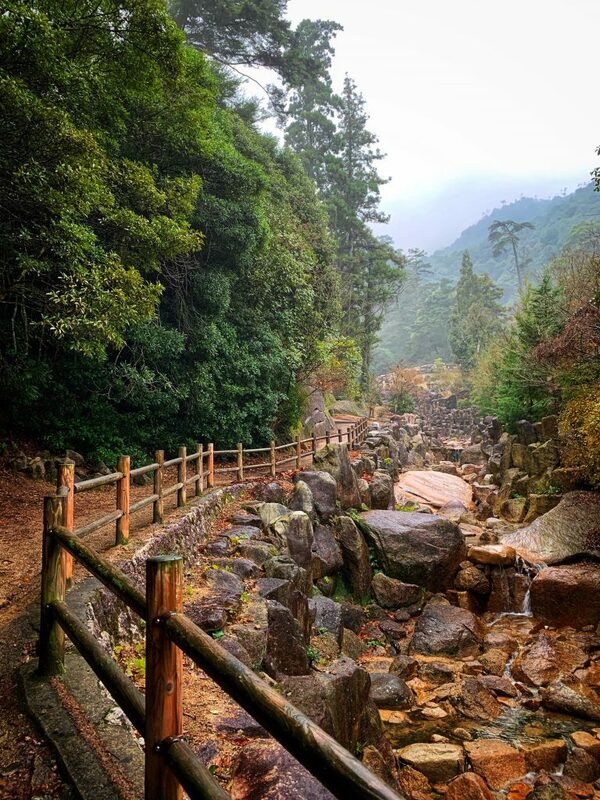 Shylen and Rytu had to not only battle the physical terrain of Mount Misen but also the lack of sunlight as it was fading quickly as dusk approached. 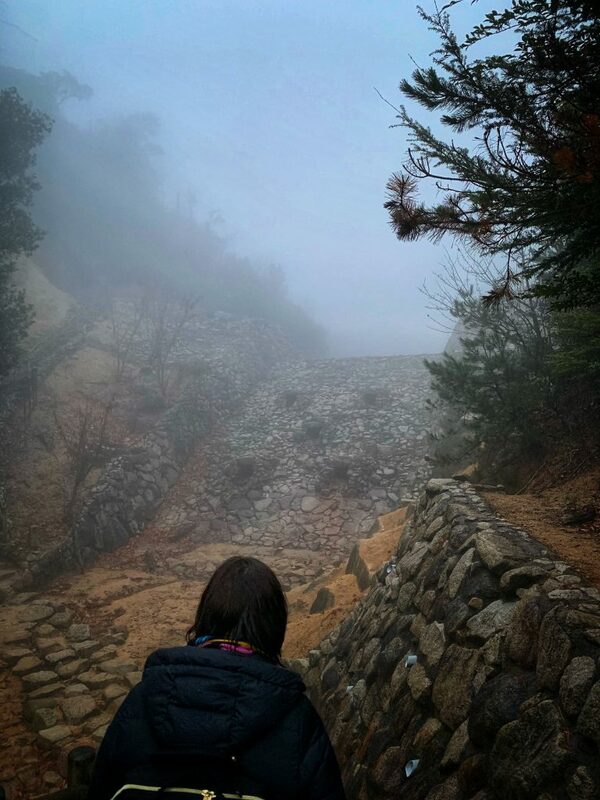 Shylen and Rytu were virtually the only people on the mountain, although they saw four other foreigners when they stopped to capture a gym in Pokémon Go at around the halfway point of the hike (legend has it that the Pokémon they left to defend the gym are still there at the time of writing this blog post). Pokémon Go, taking over a gym on Mount Misen. Shylen and Rytu began to get nervous. If it took them this long to get up the mountain, how would they get back down the mountain with enough daylight to avoid serious injury or getting lost? ”Don’t worry” explained Shylen, “we will take the ropeway. It’s a machine that takes you down the mountain. The last trip is at 5:30 pm according to the wise scriptures of Google”. So, the two continued up the mountain. 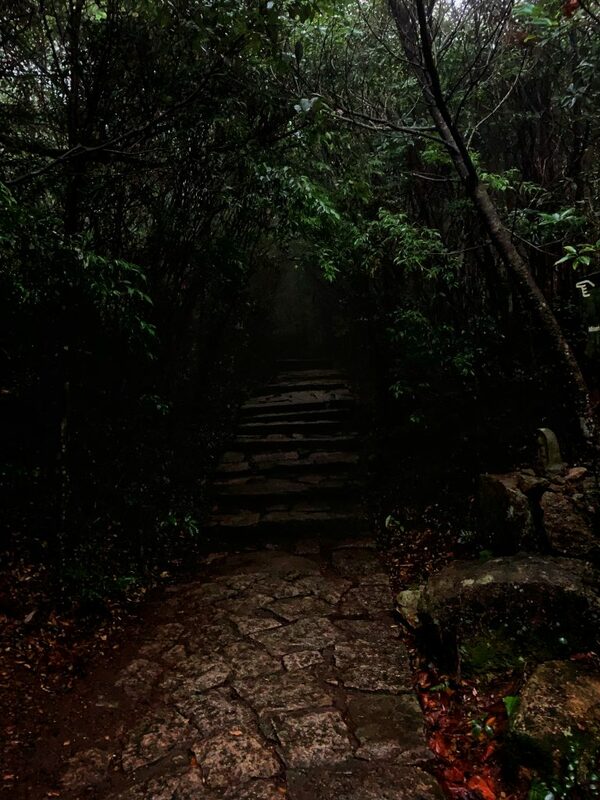 The path became more creepy as the daylight slipped away from the two hikers. Below are some photos from the hike up the mountain. The fog creeps in eerily as daylight seeps away. Giant man-made walls appear out of the fog. The hike provided beautiful views, albeit some were creepy. 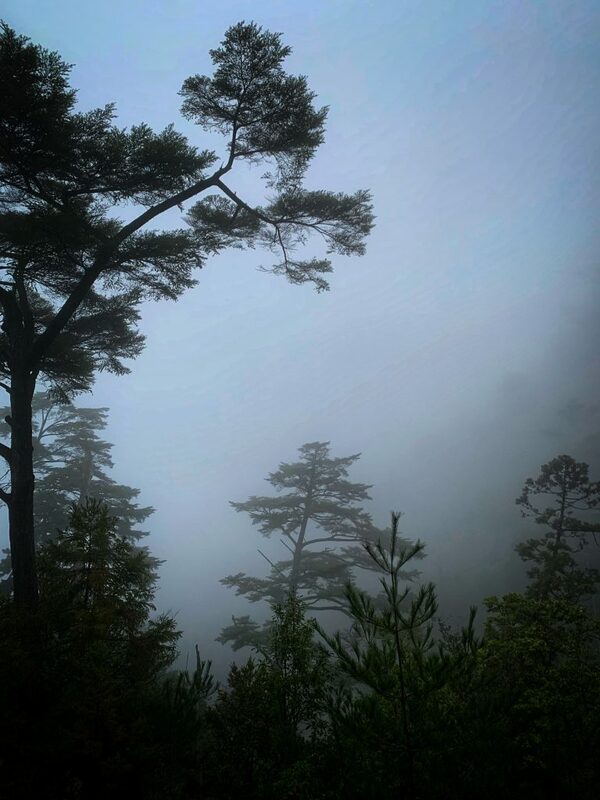 The forest is engulfed with fog, making for some beautiful photos without seeing beyond the trees. Finally, some stairs with light at the end. 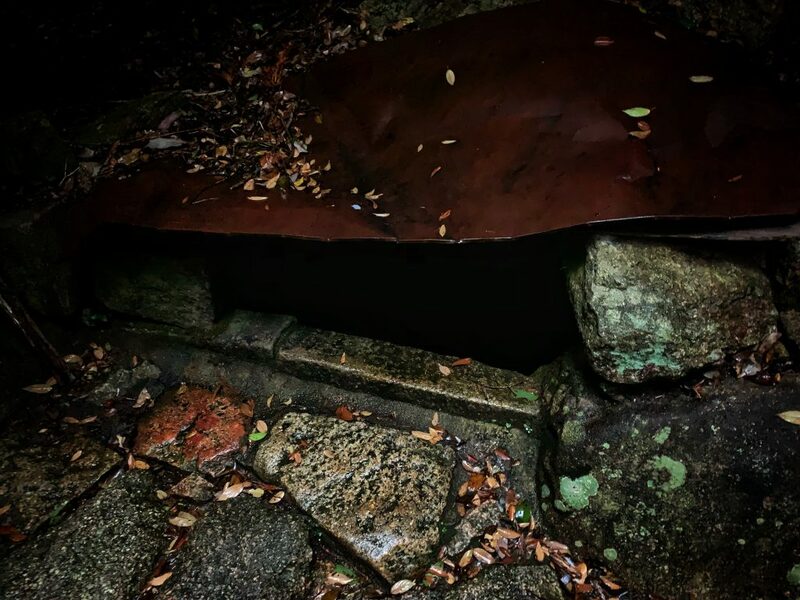 They passed scary culverts like the ones in the movie IT, sketchy “Do Not Enter” signs, warnings about venomous snakes, and walkways into shadowed staircases that seemingly disappear forever into the darkness. 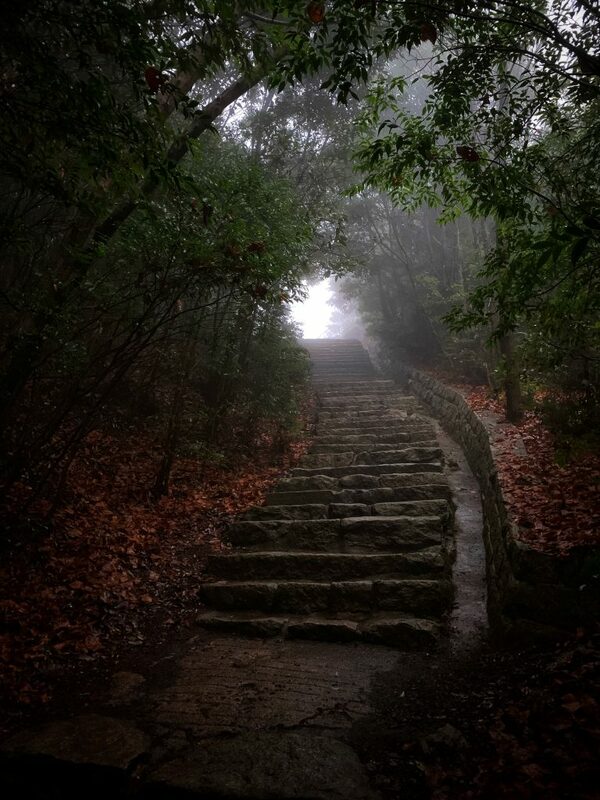 Creepy staircase into the darkness. 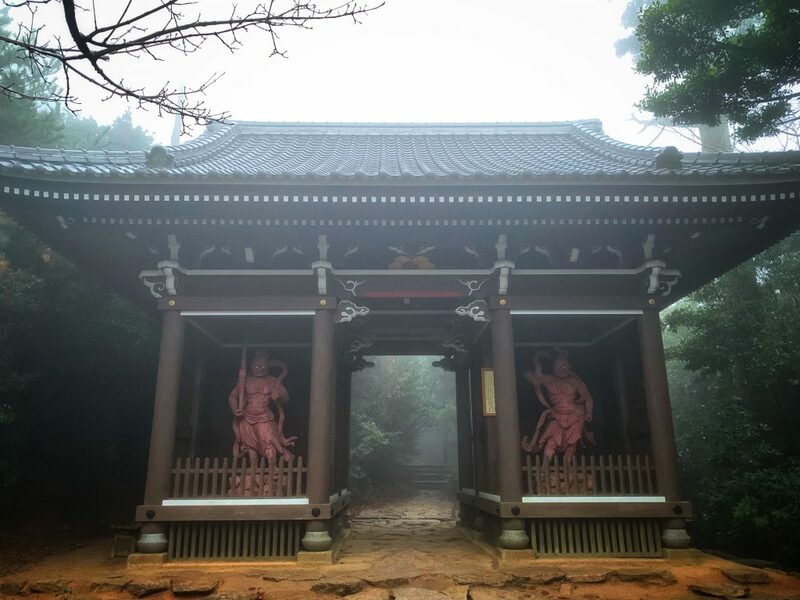 Eventually, the two hikers came upon a shrine protected by two Japanese spirits. The two hikers showed the spirits respect and were able to pass through the gate unharmed (think of this like “The Neverending Story’s’” Great Riddle Gate also known as the two sphinxes). 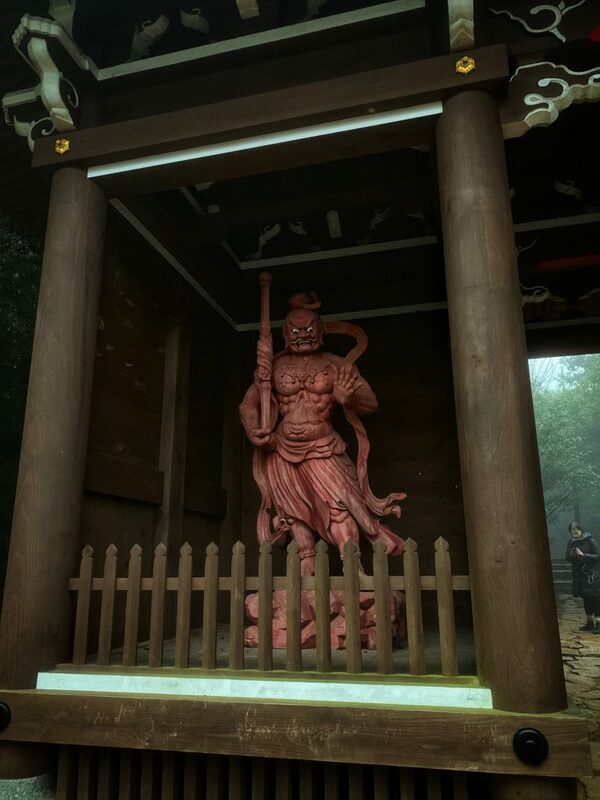 Japanese mountain shrine with two guards. Creepy as it’s getting dark. Close up of the shrine protectors. 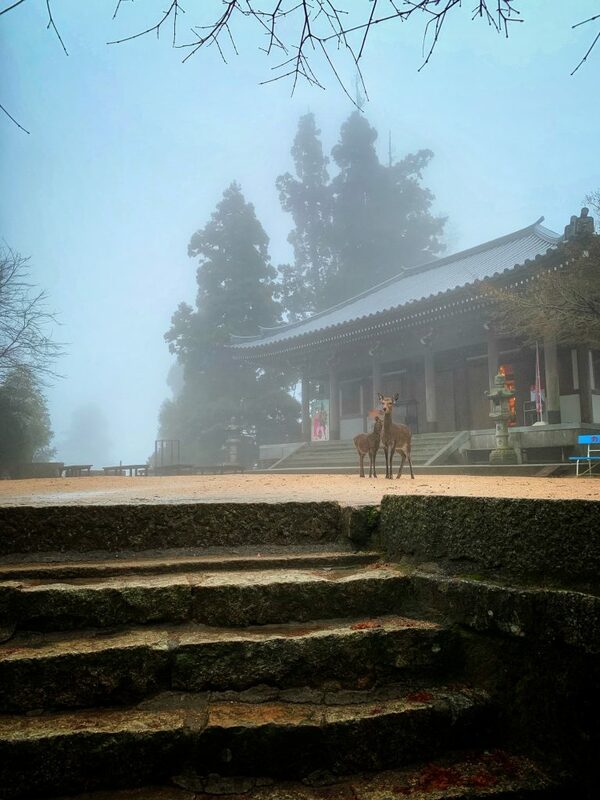 Finally, the two hikers arrived at the top of the mountain where two small buildings stood and they were greeted by three deer. They looked sad, so Shylen, who loves deer, approached them. 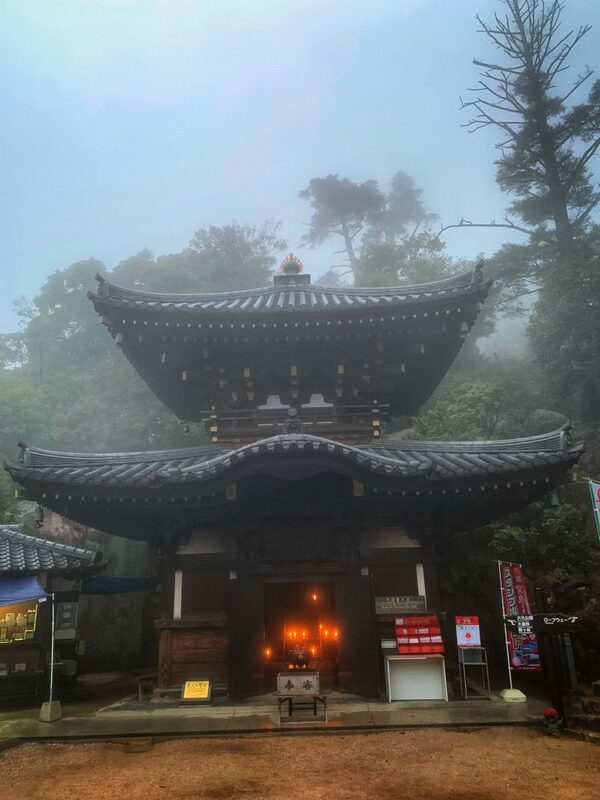 Shrine at the top of Mount Misen. ”Why are you sad?” She asked the three deer. The largest of the three deer replied, “on our journey up the mountain we lost our youngest child Deerie, we are afraid she will be lost on the mountain forever!” (***You might remember Deerie couldn’t talk, please disregard this discrepancy in the story***). A family of deer at the top of the mountain, artist rendition. The family of deer rejoiced, however they stopped when they saw Shylen’s own look of worry on her face. They asked her what was wrong and she told them that she was worried about making it back down the mountain before the darkness of the night fell upon the mountain. The family of deer pointed to a path just beyond the top of the mountain, telling her the ropeway station was just beyond the ridge! Shylen and Rytu thanked the deer family and continued toward the ropeway station. It was getting very dark, it was 5:19 pm and the ropeway closed at 5:30 pm. They were racing against the clock, and it appeared that they were going to win! 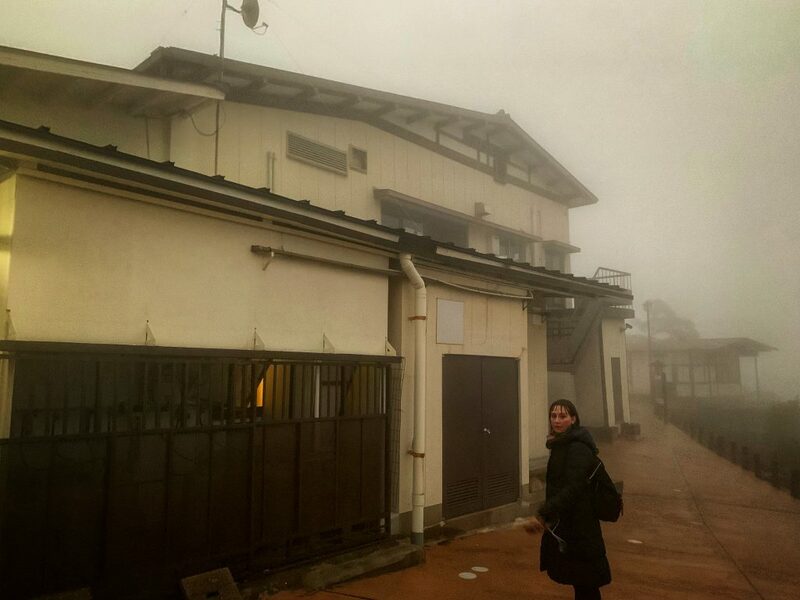 They reached the ropeway station at about 5:23 pm but it looked deserted and locked up. That’s when they saw the sign. The last ropeway departure down the mountain was at 5:00 pm. 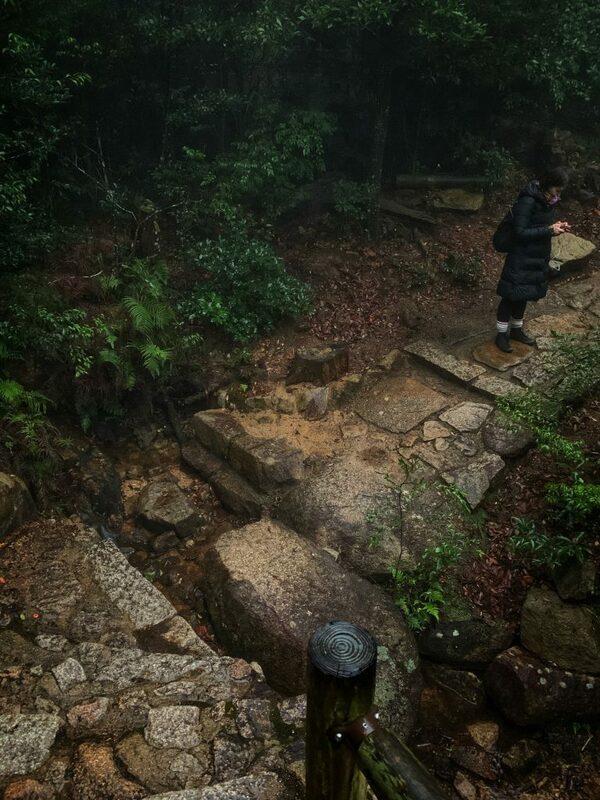 Shylen was scared, she didn’t want to have to descend Mount Misen after dark. She was afraid of the forest that covered the mountain at night. Rytu, on the other hand, was not afraid. “The night is always darkest before the dawn, “ he said. “We will follow the path back down and it will be fine. We have our cell phone flashlights to guide us, a wifi router for internet and maps, as well as two battery backups to keep our cellphone batteries powered.” (Ryan, the writer of this story and owner of this blog, maintains that any similarities between characters in this story, and real-life peoples are pure coincidence and not intentional, regardless of how heroic and chivalrous they appear). The two hikers set off down the mountain, along a different path than the one they took up to the summit. The mountain was quickly engulfed in darkness and they could not see even one foot in front of them. However, their cell phone flashlights cut through the darkness and led them down the mountain. Going down was significantly easier than going up, but the path was still dangerous. Although the cell phone flashlights cut through the darkness they still cast shadows on the ground which made navigating the path still dangerous. The pathway was also sometimes tricky to follow and any misstep could result in falling over the edge of the path, into the heavily wooded ravine below. The path can become broken. This photo was taken while sunlight was available. Imagine trying to navigate this at night in the pitch black. The two used signs placed every 100 meters to ensure they were on the right path and eventually they found Momijidani Park. This meant they were safely down the mountain. Soon they found the small town from which they began their adventure and they were safe. 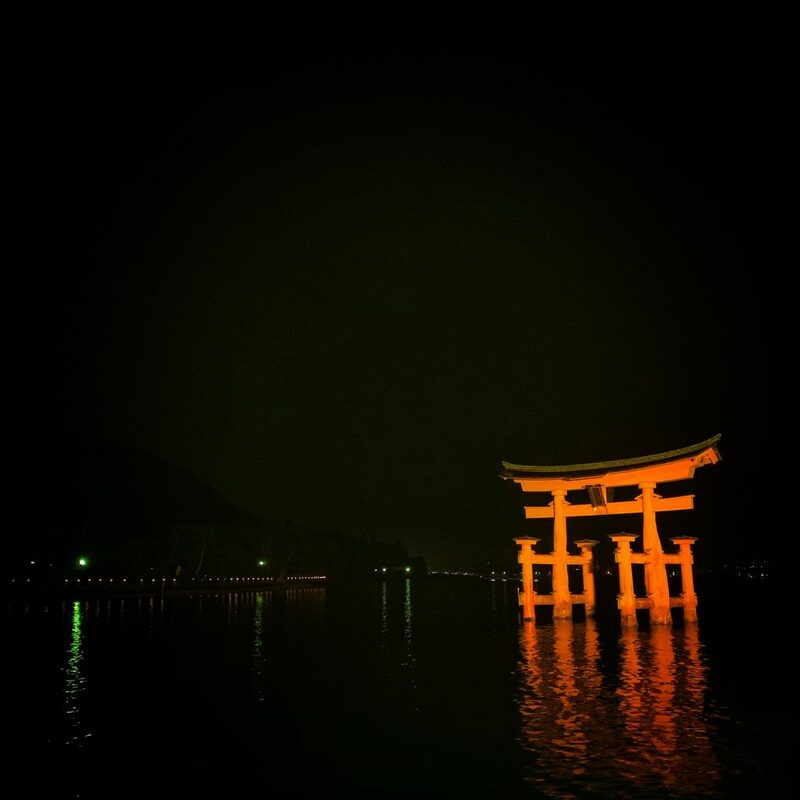 Night time gate to Itsukushima Shrine area. 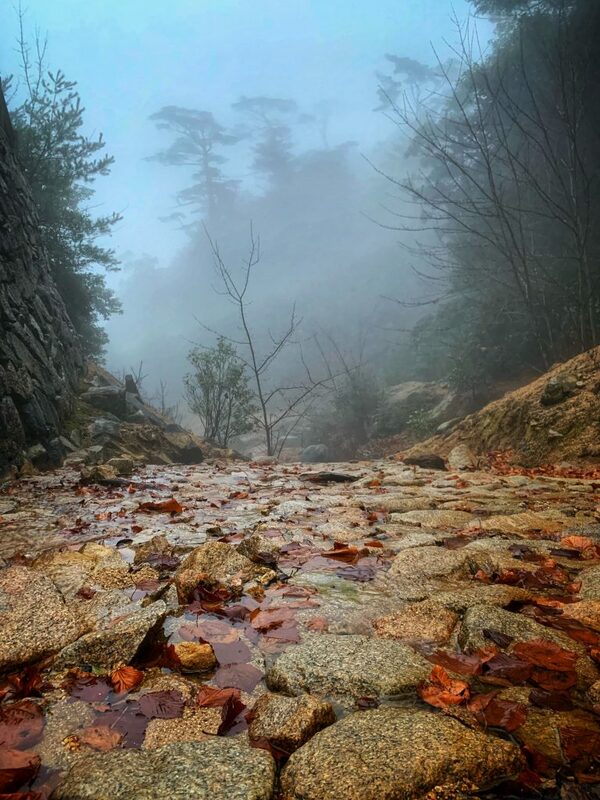 What a wild hike up Mount Misen that Shylen and Rytu had! 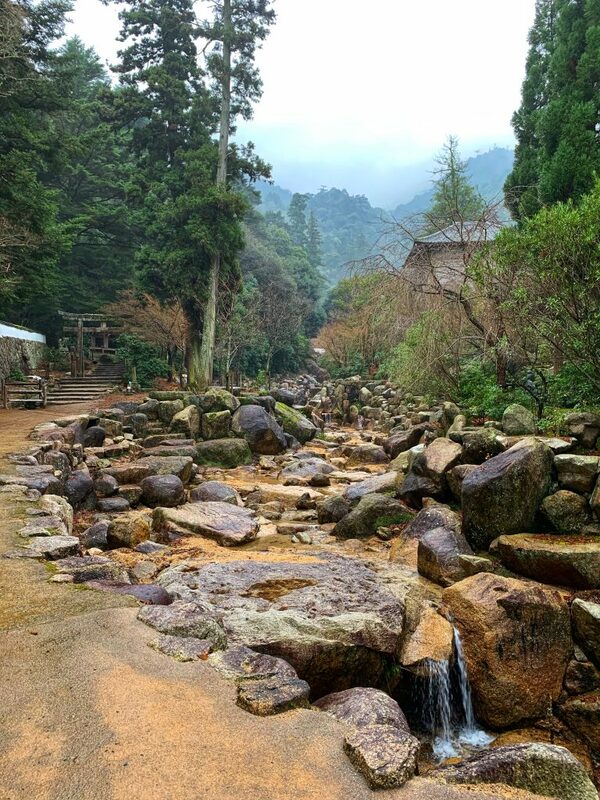 Shylen thanked the Japanese gods that safely guided them down the mountain. The two bid farewell to Itsukushima Shrine, boarded the ferry, and made their way back to the hotel they were staying at in Hiroshima. 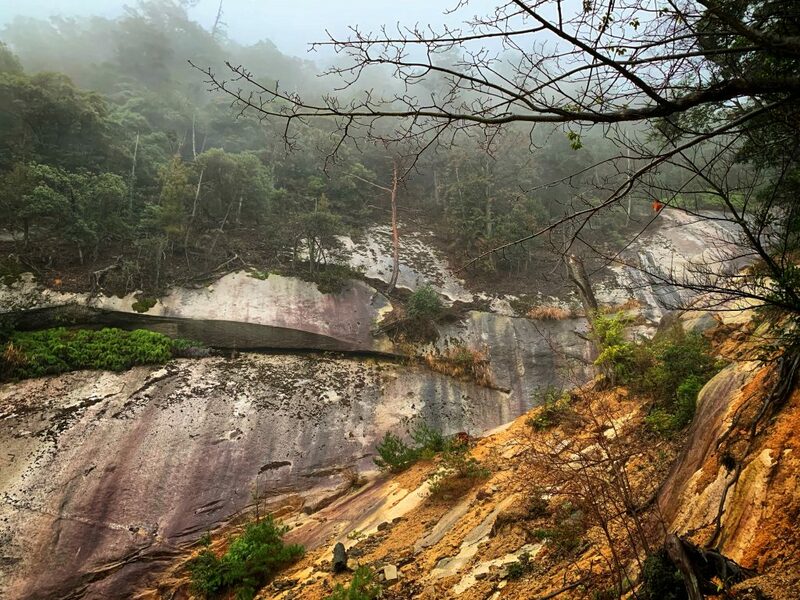 For complete photos of the hike up Mount Misen please click here!